Our best-selling business time cards can track up to 7 weekly jobs, yet fit in a shirt pocket! Clearly track employee hours & wages! 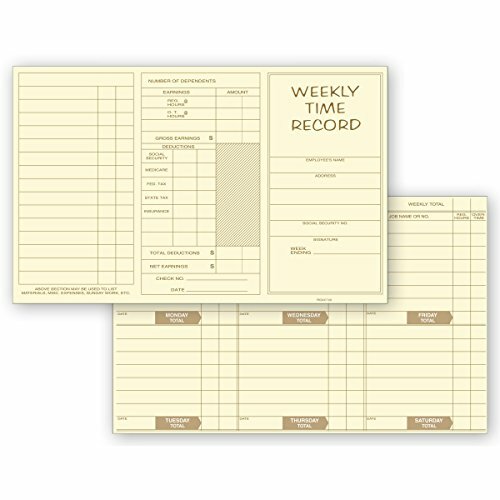 Preprinted time cards have ample space to record jobs worked on, hours, overtime, earnings, & deductions. Folds to fit in shirt pocket, so time worked can be documented anywhere. Preprinted areas for recording hours, overtime, materials & expenses. Compute earnings & deductions right on the card. At CheckSimple, your satisfaction is 100% guaranteed. Not happy with your business check, deposit slip, or business supply order? No problem. Just contact us and we'll take care of you! It's simple. Our goal is to offer you high-quality business checks, deposit slips, and accessories at low, everyday prices. Compare our business checks and accessories with anyone else and we think you'll agree, CheckSimple has the perfect business checks and accessories for any business and any budget. If you have any questions about this product by CheckSimple, contact us by completing and submitting the form below. If you are looking for a specif part number, please include it with your message.